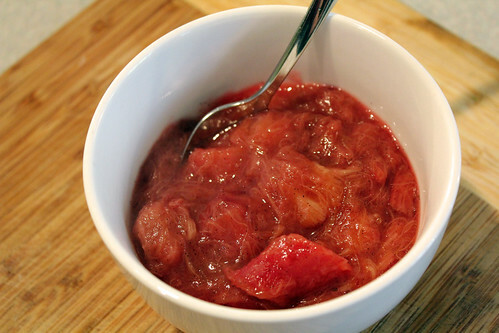 Continuing with the rhubarb recipes this compote is a delightfully easy way to add a little zing to waffles, yogurt or scones. It comes together in about half an hour, you can start is simmering on the stove and then make a batch of cream scones, lovely adapted from the Holy Grail of breakfast cookbooks. I’ve made this compote a number of times this spring. The first time I made is I used a delightful amount of deep brown sugar. I loved, loved, loved the flavor, but the deep molasses color of the brown sugar make the whole pot look more like slop than the vibrant, red color I was going for. I think first and foremost food should taste good, but since we eat with our eyes as much as with out tongues, it should look good too. I may have to keep working on the brown sugar rhubarb combination. Maybe it is better suited for a crisp or crumble where it can hide under a layer of oatmeal. This compote allows the rhubarb to take center stage, it is only smoothed out slightly by the sugar and vanilla bean. The slow simmer allows the flavors to meld into something quite delightful. You can make a batch on Saturday morning and save one jar in the fridge for several days, add a dollop to your weekday morning yogurt or smear some on your toast over a healthy spread of butter. It, of course, will lead you to fix a cup of tea and relax in to the morning, if only for a few moments. If you don’t mind a rather unappetizing color you can use half white sugar and half brown sugar, it really does have a lovely flavor! Combine the rhubarb and sugar in a large thick-bottomed pot. 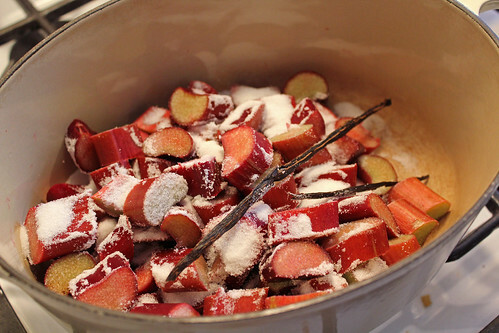 Toss the rhubarb to coat with the sugar. Add the vanilla bean and the squeeze of lemon juice. Cover and cook on low for 20-30 minutes, until the rhubarb is soft. Remove from heat and remove the vanilla bean. Allow it to cool before using on dairy like yogurt or ice cream, but it is wonderful warm if you want it on scones or waffles. This entry was posted in Breakfast, Fruit, Recipe and tagged Breakfast, Recipe, Rhubarb. Bookmark the permalink.